The Pines is close to the Denver Tech Center and a Light Rail Station. Easily walk to the Highline Canal, parks and shops. The neighborhood is close to the well-established Homestead neighborhood and Willow Creek neighborhood. The Pines is a relatively small development located in the Northwest of Centennial City and is in the one less built up areas of the city. As with many other locations in the Aurora/Denver area The Pines gives you that sense of not living in an overcrowded suburban sub-division but still places you close enough to all modern amenities to make your life as comfortable as you need it to be. A testament to the way the city is planned is the fact that the Marjorie Perry Nature Reserve, containing several small lakes and a walking trail, is only a stones throw from The Pines neighborhood itself. When it comes to prices for properties in this area they're pretty static without too much deviation upwards or downwards on price. In fact it's actually quite difficult to find more than a handful of properties in The Pines available to buy at any time of the year - a hint to what a great neighborhood it is to live in. 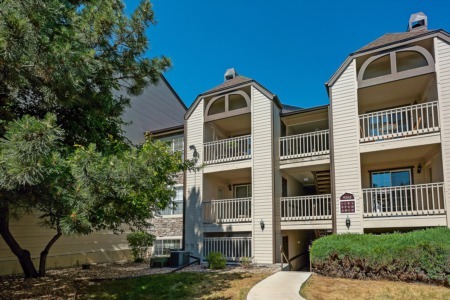 In terms of general amenities The Pines has a lot to offer any potential owner-occupier or investor starting with tennis courts and a swimming pool in the area so you won't have to travel very far for a dip during the hot Colorado summers. Shopping is amply catered for by a King Soopers and other similar stores in the area. If you like eating out then the Venice Italian restaurant is on your doorstep and there's even the Koelbel library to keep your literary needs satisfied. Orchard Road and Bellview Avenue connect this cozy community to the rest of Centennial City and of course via the I-25 to the rest of the Metro Denver area. Homes in The Pines, when they're available, are an ideal way for your family or business to get onto the property ladder in Centennial City.